Kluwer Academic Publishers, Norwell, MA, 1993. 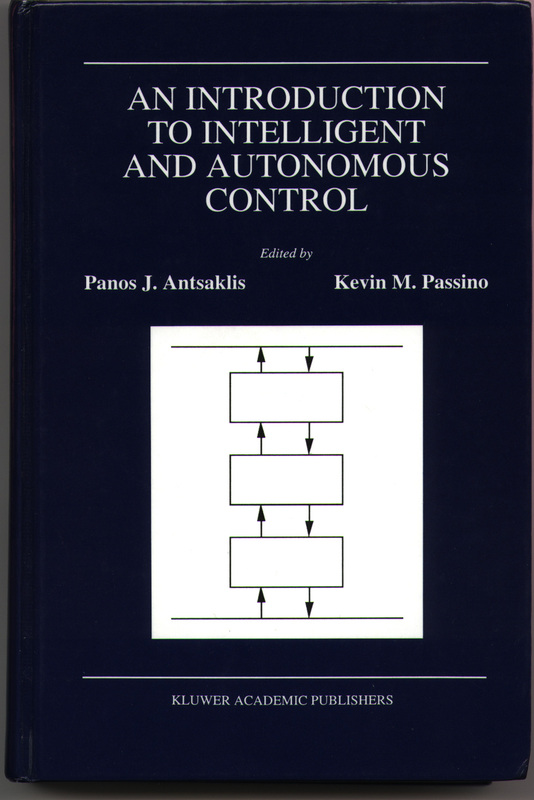 Synopsis: An introduction to the field of intelligent control with a broad treatment of topics by several authors (including hierarchical/ distributed intelligent control, fuzzy control, expert control, neural networks, planning systems, and applications). This is an edited monograph with original contributions from each author. How to get the book: Book is no longer in print from Kluwer. You may be able to get a used copy off Amazon.com, but DO NOT BUY IT! This book is available in electronic format for a FREE download by clicking here. Addison Wesley Longman, Menlo Park, CA, 1998 (later published by Prentice-Hall). 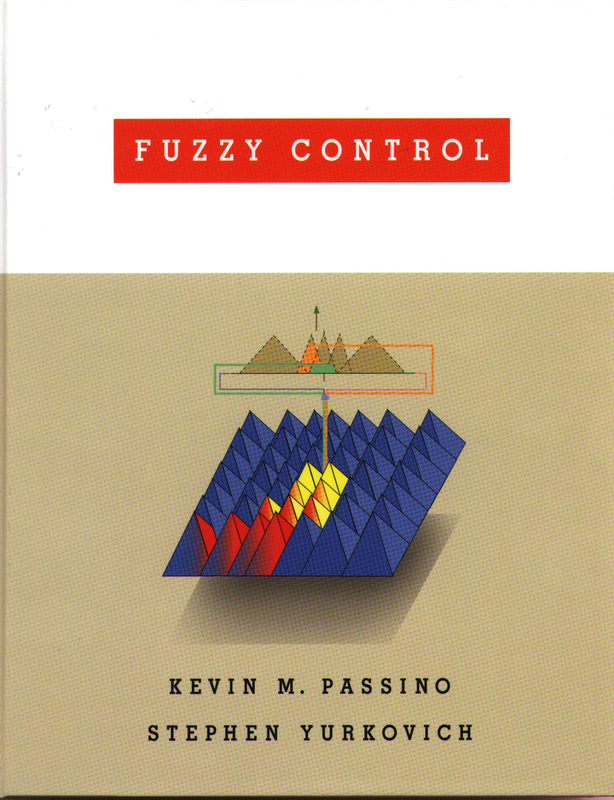 Synopsis: An introduction to the field of fuzzy control with a broad treatment of topics including direct fuzzy control, nonlinear analysis, identification/ estimation, adaptive and supervisory control, and applications. This is a textbook with many examples, exercises and design problems, and code available for downloading (also, this book is listed as a Matlab textbook at Mathworks). Supplemental Information: For the errata, click here. 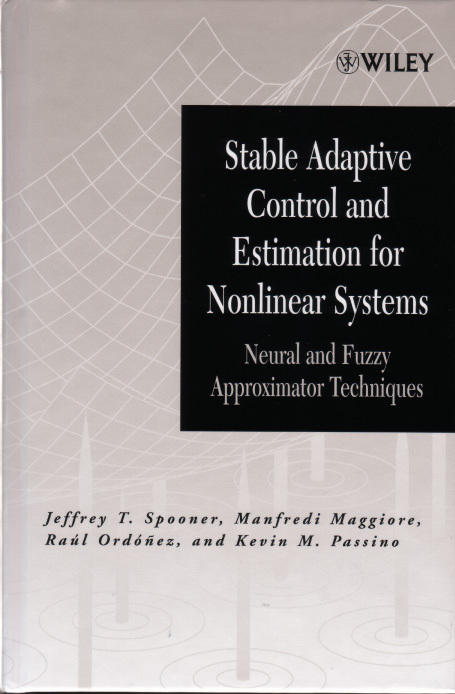 You can get the code for the book (e.g., fuzzy controllers, estimators, etc.) by clicking here. How to Get the Book: Book no longer in print. You may be able to get a used copy off Amazon.com, but DO NOT BUY IT! This book is available in electronic format for a FREE download by clicking here. John Wiley and Sons, NY, 1998. 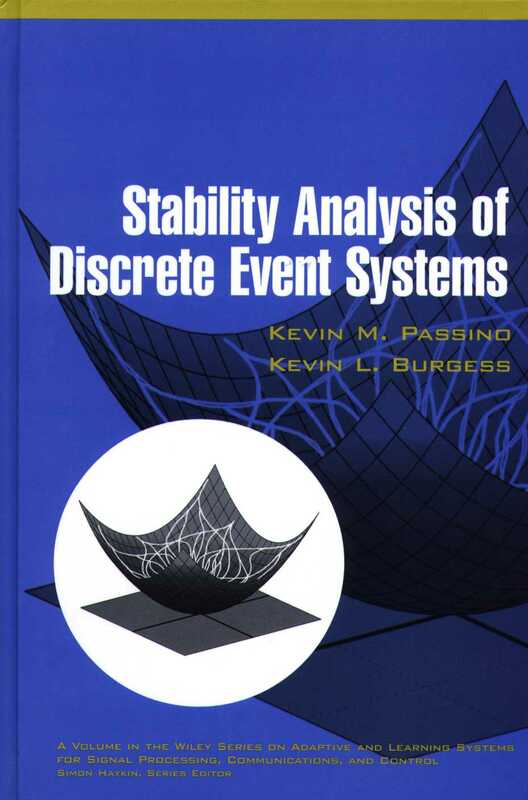 Synopsis: Covers the theory and application of stability analysis for discrete event systems. The main relevant stability theory is developed, models are introduced, and three classes of applications are considered: load balancing systems for computer networks, scheduling flexible manufacturing systems, and intelligent control systems. This could be used as a textbook and there are many examples and homework problems. Ordering Information: See Amazon.com by clicking here. John Wiley and Sons, NY, 2001. Synopsis: Shows how to structure and implement hierarchical and distributed real-time control systems (RCS) for complex control and automation problems. Starts with a tutorial introduction showing how to implement an RCS for a university tank experiment using the RCS software library. Provides a user's manual for all software details, with examples from an autonomous vehicles problem. Supplemental Information: To get the code and a significant amount of other information on this topic click here. Ordering Information: See the web page at John Wiley and Sons by clicking here. For Amazon.com click here. For background information on RCS click here. John Wiley and Sons, NY, 2002. Synopsis: Introduces stability, approximator structures (neural and fuzzy), and relevant approximation theory. Develops stable indirect and direct adaptive fuzzy/neural controllers for state-feedback, output feedback, and MIMO continuous time cases. Also, shows extensions to discrete-time and decentralized control. Gives many examples, applications, and experimental results (also, this book is listed as a Matlab textbook at Mathworks). Supplemental Information: To get Matlab and C code for solutions to some of the problems studied in the book click here. Ordering Information: See the web page at John Wiley and Sons by clicking here. For Amazon.com click here. 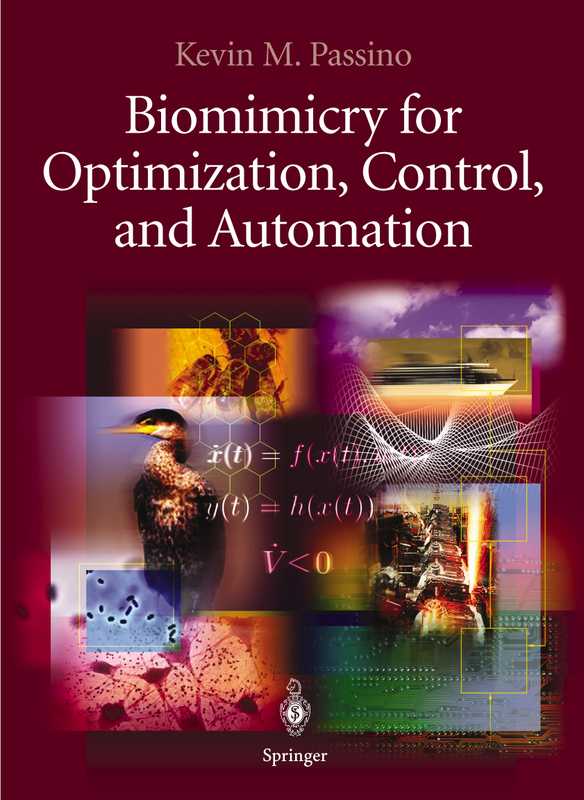 Synopsis: Part I: Introduction: Challenges of control and automation, scientific foundations of biomimicry. Part II: Elements of Decision-Making: Neural network substrates for control instincts, rule-based control, planning systems, attentional systems (including stability analysis). Part III: Learning: Learning and control, linear least squares methods, gradient methods, adaptive control. Part IV: Evolution: Genetic algorithm, stochastic and nongradient optimization for design, evolution and learning: synergistic effects. Part V: Foraging: Cooperative forarging and search (including swarm stability), competitive and intelligent foraging. Supplemental Information: There is a significant amount of Matlab code that is provided with the book, and you can get by clicking here. Ordering Information: See the Springer web page, or see Amazon.com by clicking here. Synopsis: Introduction, continuous time swarms (single integrator, double integrator, model uncertainty, unicycle agents, formation control), discrete time swarms (one dimensional, distributed agreement, formation control, potential functions), swarm optimization (bacterial foraging optimization, particle swarm optimization). 3rd Edition, Bede Publishing, Columbus, OH, 2016. 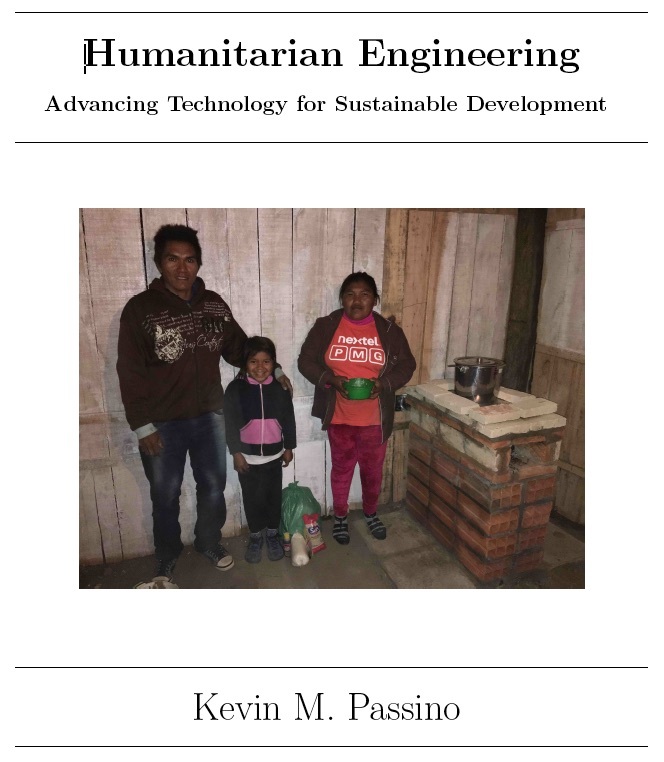 Synopsis: Poverty, development, sustainability, culture; Social justice, religious and secular views; Development strategies: economists, health, education, business; Engineering for community development, helping, communities, participatory development, teamwork and project management, communithy assessment, project selection, humanitarian technology, STEM education. Analytical studies of finance management, social justice, poverty traps and technology diffusion, cooperative management of community technology, community dynamics and sustainable development. How to get the book: For a free download of this book (785 pages), and Matlab code for plots and homework problems, click here. For online courses taught out of this book, click here.